Today we are interviewing Suresh K Sharma about his non-fiction business book The 3rd American Dream, which focuses on Innovation, Entrepreneurship and Economic Growth. Suresh is a seasoned global business leader recognized for his pragmatic vision, operational excellence, technology inventions, cross-border mergers and acquisitions, and entrepreneurial successes. He has contributed extensively to the Energy, Aerospace, Advanced Materials, Defense, e-Business, Healthcare, Six Sigma Quality, Network Security & Analytics, Global Sourcing, Supply Chain, and FMCG industries. A former GE executive-turned-entrepreneur, his passion is to grow both small and medium businesses into profitable, successful enterprises. 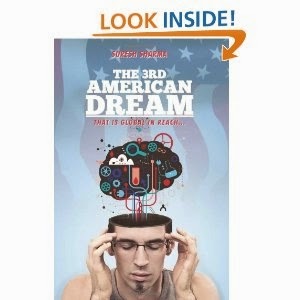 Most recently, he published his second book - “The 3rd American Dream” (2013). This book details how innovation and entrepreneurship, are yet again, transforming the next economic expansion in the United States that is bound to have unforeseen global impact. In a new global economy, the so-called American Dream has undeniably shifted from a mid-century phenomenon to an increasingly unnerving question mark. However, according to the author, a new wave is on the rise, and here. The next dream is very much in the making for anyone with any innovative and entrepreneurial spirit. In his new compelling book, The 3rd American Dream, Suresh - an internationally acclaimed business leader, entrepreneur and a thought-leader - shares his insights and conviction supported with a pragmatic roadmap to make it happen faster. Drawing from his own demonstrated global business and entrepreneurial successes, as well as his perspective as an immigrant, Suresh is committed to inspire all Americans to unlock their potential and to realize an unprecedented wealth creation in the twenty-first century. The heart of this book is about American way of life, entrepreneurship and innovation. Impact and reach, however, is bound to be global. According to the author, it’s time to move on to a new way of thinking, living, and doing business, especially after the recent demoralizing recessionary times. Rather than a traditional business book, Suresh’s approach represents an entirely new genre that stitches all the special-knowledge domains - “the verticals” - into one fabric - be they: people, culture, economics, capital, technology, policies, infrastructure, society, business or historical lessons - to make meaningful practical life decisions going forward. It’s easy to read but definitely thought provoking. He thus lays out a pragmatic and inspirational game plan for Americans to create a groundbreaking ecosystem - at individual as well as societal level - that would result in a new wave of infinite economic expansion. To do so: • The 3rd American Dream first provides a quick historical context of the “American Way of Life,” revisiting characteristics long associated with this country’s success, such as Americans’ entrepreneurial nature; commitment to innovation; impulse to aspire to a greater life; and repute as creative problem solvers. How is the younger generation is changing the game in their own entrepreneurial and innovative ways? What can you do as an individual? What can be your future roadmap in this huge economic potential and prosperity? With examples, he brings out how entrepreneurship and innovation are universal, and independent of age, gender, industry, and location. • Suresh then explores the future of the country, proposing how to create a new business ecosystem. To make it real, he addresses ways in which to make game-changing improvements in crucial platform industries such as: Healthcare, Energy, Education, and Manufacturing. Finally, his book puts forth the notion of inclusive growth, which can occur by creating the next generation of jobs within the country, with a new generation of wealthier, innovative, and entrepreneurial middle class of twenty-first century America. With keen insight, and an American “can-do” attitude, the author has created a refreshing look at the country’s future prospects, and is happy to report that with right approach, the American dream will surely live on, but will clearly be global in its reach. Check the ‘Inspiration’ - the very first section in the book. The United States is in fact the biggest emerging market, and out best times are yet to come. Tell us a bit about your background as an entrepreneur. 5 Start Ups, 1 Failed, 1 Publicly-listed, 1 is ranked #31 fastest growing company by Inc 500, 1 average, and 1 merged with a Fund. How has your experience as an immigrant shaped your vision of American economic success? What do you think brought about the end of the second American dream? Understanding of an equilibrium between the necessity of supply&demand for a free market driven economic expansion. How do you think federally backed startup funding will benefit the economy? Long and steady economic expansion in the 21st century driven by unlocking full innovative potential of entrepreneurs. The idea is not to get hung-up by one Silicon Valley but have hundreds of such ecosystems across the country to drive growth. Create a level playing field for all of our young generation. You’ve done a lot of international traveling. What gives you faith in the American economic system? The fundamental ‘American way of life’, business ecosystems, and innovative potential driven by incredible R&D infrastructure is a great differentiator. However, our policies will have to be predictive to stay relevant to present in the light of knowledge explosion. Do you think America’s policy makers are enabling the third American dream you write about?Not enough. We need more pragmatic visionaries who can make tough calls to truly reform and realign our framework for future and not just rest on past laurels. This book stitches the existing knowledge of various specialist domains for you to be able to make meaningful decisions for your own life going forward.